Merry Christmas from the Millennial Homemakers! This year, we’re celebrating by bringing you the Twelve Days of Christmas. 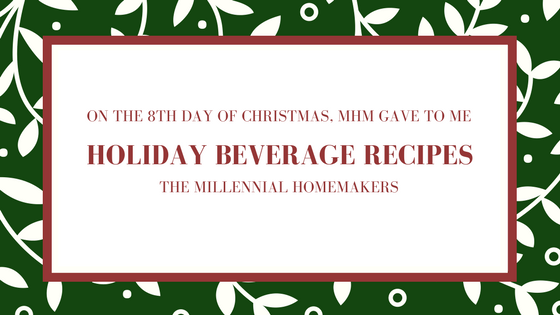 On the eighth day of Christmas, the Millennial Homemakers give to you - Holiday Cocktails and Mocktails! We’ll share some of our favorite Christmas-inspired beverage recipes (alcoholic and non-alcoholic)! In a copper mug, mix vodka, syrup, lime juice, spices, and molasses. Add all ingredients to a slow cooker and stir. Cook 3-4 hours on low. Combine lemonade, orange juice, cranberry juice, water, and sugar. Stir, then cover and refrigerate for 1-2 hours. Add ginger ale and fruit. Serve. Combine bourbon, syrup, milk, and vanilla extract in a shaker over ice, and shake. Strain over fresh ice in a large rocks glass. In a small pot, combine sugar, juice, cranberries, rosemary, and ginger. Bring to a simmer and let simmer for about 30 minutes (until cranberries start to pop open). Remove rosemary and mash cranberries. Simmer for 15-20 minutes, until mixture is thick and syrupy. Remove from heat and let cool completely. Add 2 tablespoons of mixtures to champagne flutes. Top with champagne.